Aperion Management Group's team of managers are experienced in the industry and grounded in the needs of our clients. 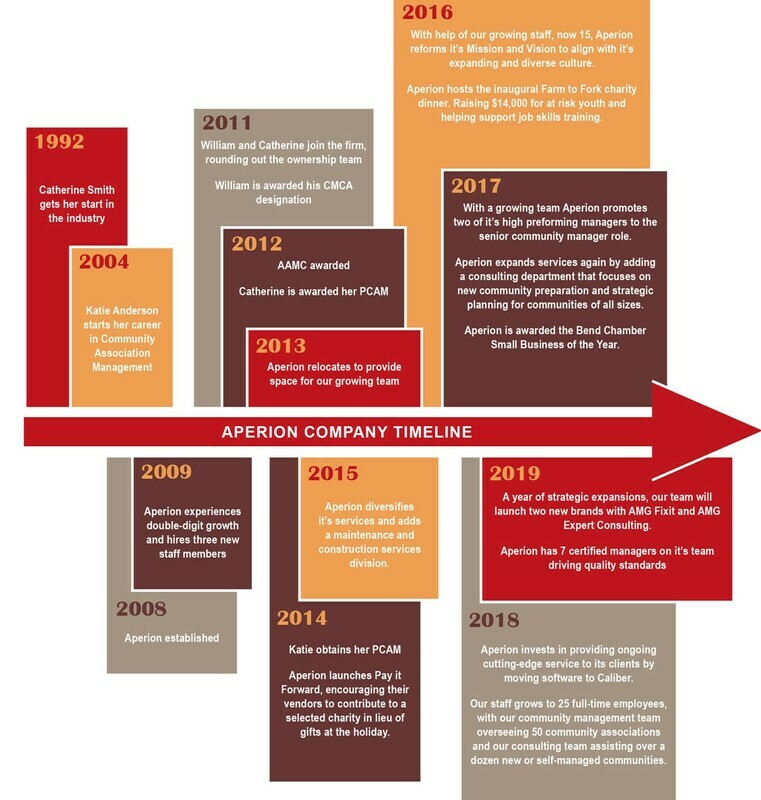 With over fifty years combined experience in management, building and development; Aperion Management Group has several key qualities which stands above the rest. Completely local, including our accounting team. Nationally certified through CAI in the field of HOA management. Serving on the CAI Oregon Chapters Regional Council Board of Directors and are members of CAI national. Extensive experience with CCRs and enforcement. Experience in reading plans and architectural reviews. Broad experience managing communities of all sizes and demographics. Up to date knowledge on state and local laws. Aperion Management Group's team has taken specific illustrations of a need to create a more responsive and efficient management process for communities as a whole, and incorporated these into our processes and philosophy. Aperion Management Group combines a fresh perspective with dedicated strategic planning that allows communities to foster a better living environment for all parties. While Aperion Management Group is built upon the foundations of experience, continual education is one of the cornerstones in being able to address a full breadth of the complex situations facing our clients. We hold the belief that a holistic approach is necessary; it is instrumental in fostering comprehensive client-centric solutions. Aperion moves beyond the required and strives to surpass excellence. Our clients expect us to look beyond the now, understand approaching issues and develop responses preemptively. Aperion Management Group does not strive to refine the management process, but to redefine it. This allows the community management to be a more efficient and beneficial process for all involved. Enabling strategic partnerships to flourish through the diligent management our clients deserve.